This two-band enlarging easel eliminates slip ups. Bands have perfectly square margins. They will not shift once positioned, but they can be moved if desired by applying pressure to the control knobs. The 670-series enlargers accept all negative formats up to 2¼" x 2¾" (67 cm) and share the same chassis assembly, negative carriers, and lensboards. The lamphouses are interchangeable and their differences are noted under each catalog number. A massive, aluminum girder locks into a die-cast base-sturdy and vibration-free. It permits 18X magnification from 35MM. The anodized black girder comes with a reference scale. A counterbalanced, die-cast carriage with nylon bearings offers smooth and effortless travel. Precise focusing - through double rail, lash-free, adjustable friction drive controls. Left/Right-handed focusing knobs are standard. An extra long bellow facilitates small prints or reductions. A large baseboard allows you to print 16x20's. All surfaces are laminated and the edges are vinyl banded. 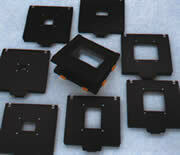 Extremely high-quality, hinged negative carriers in both glass and glassless models. Base Dimensions 18" x 23" x 1"
Dichroic lamphouse with stepless 0-200 (Cyan 0-170) continuously. Color-coded, illuminated filtration scales in 1cc increments. White light focusing and safety indicator. Converts in minutes to full-featured slide duper. An accessory kit is required (Cat. #74867-40, sold separately). Supplied with 12V/100W Quartz-Halogen lamp (EEP) & 6 x 7 mixing chamber. Includes standard removable power supply; Leica-threaded. Negative carrier, red filter assembly and lens not included. Triple condenser lamphouse with all glass optics. Condenser matched to all formats up to 6x7cm. Supply with 75W/120V opal lamp (PH140), safety filter and two-way lensboard. Dual filtration channels in one head. Channel one is calibrated for Kodak Polycontrast III RC paper (grade 0-5); Channel two is calibrated for Ilford Multigrade III RC paper and compatible papers (grade 0-5). Memory-LockT white-light system for easy focusing. 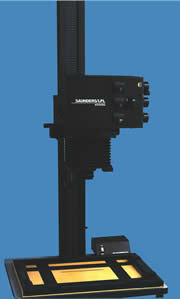 It has variable contrast/contrast exposure printing capabilities. The channels have built-in neutral density, which allows for consistent exposure for the full range of paper grade selections. Has a continuous variable dial for desired paper grades. Filtration is achieved with cut-off dichroics. For new Kodak Polymax RC papers, supplementary filters are supplied to cover the expanded -1 to +5 range. Supplied with 12V/100W Quartz-Halogen lamp & 6 x 7 mixing chamber. Negative carrier and lens not included. *Owners of the 670-CXL Triple Condenser Enlarger who wish to purchase the 670-VCCE, will need to order the Standard Dichroic Power Supply (Cat. #74866-35). Those whom already own the 670-DXL or MXL should purchase the head only. Professional quality, with black, anodized aluminum construction. Features four individually adjustable masking blades and removable glass inserts. Top and bottom glass can be removed to convert it to a single-size glassless carrier by means of lock-in inserts. Fine Focusing Attachment: A double-stage, 5:1 geared fine-focusing knob which replaces the standard knob for very critical focus control. Copy Camera Adapter: An extra-heavy, machined camera stage that replaces the lamphouse projection assembly to convert the enlarger into a heavy-duty camera copy stand; single knob conversion; no tools required. A pair of L-shaped supports for printing long rolls of film. It prevents damage to the film. These enlargers have common a lamphouse and chassis configuration with different slide-in filtration modules, depending on the model. 4x5" enlargers accept all film formats from 35mm to 4 x 5". The 4550XLG has a longer column and an extended chassis, a larger baseboard, and a higher output lamp. A massive oversized column assuring strength, rigidity, and a vibration free environment. A factory-aligned carriage and column for perfect alignment and elevation. A convenient elevation system with a hand grip for rapid lifting and a drive knob for finer changes. It has a separate locking knob. An Interchangeable Diffusion Chamber and Light Multiplier (4 x 5" supplied), and rotating lens boards. Built-in, vibration-free, noiseless blower and a heat sink. Geared, dual-range, fast-fine focus control. Dual stainless steel focusing rails. A fully laminated, oversized, neutral gray baseboard with a vibration-dampening double plate. Supplied with: Quartz-Halogen lamp. Regulated solid-state power supply. Swing away combination red safety filter and under-the-lens-holder. Does not include: A negative carrier, lens or lens mount (see accessories list). Baseboard 31½ x 23¾ x 1" 23¾ x 23¾x1"
Girder 53 x 4¼ x 3½" 47 x 4¼ x 3½"
Carriage fully raised, Hgt 59" 53"
Max. bellows extension 9" 9"
Bellows 6½ x 6½" 6½ x 6½"
Important Note: The column and carrier of these enlargers are factory matched. Carton #1 and #2 have been marked with a serial number at the factory. The head and column themselves are also numbered. It is mandatory that the customer receive cartons with matching serial numbers. Supplied with 250 watts, 82 volt EVW quartz-halogen lamp for 25% greater light output. A Whisper ToneTM muffling fan system for quiet operation. The fan is mounted on shock-dampening bearings to eliminate vibration. Extra-long column and oversized baseboard allows 20x24" enlargements of 35 mm negatives (using 50mm lens). An extended carriage increases the distance from the column to the lens axis by 2½" which allows for use of a larger easel (20 x 24"). As described. Includes Dichroic Filtration Module with 0-200 yellow, 0-200 cyan, and 0-170 magenta stepless and continuously variable filtration. Permanent, fade-free dichroic filter. Color coded, illuminated filtration scale calibrated in 1cc increments. As described. Includes a special Dichroic Filtration Modulecalibrated for the filtration requirements of Ilford Multigrade III variable contrast paper. Instantly set for the Ilford filter equivalent (conversion chart supplied for Kodak papers). Automatic neutral density (ND) filter keeps exposure times constant throughout the contrast range. As described with same quartz-halogen/diffusion system for fast B&W printing and the scratch and dust suppression characteristics of diffusion-type light sources. This is a valuable 4 x 5" enlarger, with all of the features listed. Supplied with 200watt/82volt (EYA) Quartz-Halogen lamp with integral dichroic reflector. Permanent, fade-free dichroic filters. Color-coded, illuminated filtration scales calibrated in 1 cc increments. Memory-Locks(TM) instant while light focusing. As described. includes a special dichroic filtration module calibrated for the filtration requirements of Ilford Multigrade III variable paper. Instantly set for the Ilford filter equivalents (conversion chart supplied for Kodak papers). Automatic neutral density (ND) filter keeps exposure timesconstant throughout Multigrade contrast range. Fits all Saunders/LPL 4550XLG and 4500-II enlargers. Both models are easily converted by switching the modules. Hinged sandwich design for fast handling and loading. Guide pins automatically position negatives in line with carrier aperture. Offset tabs permits rapid opening of carrier. 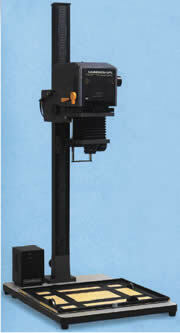 All 4500 Carriers can be used on Omega D5 Enlarger. For 40/60/80 mm, Rogonar 50mm, Rogonar SC 50/75 mm, Rogonar S 25/35/50/90/105mm, Rodagon 28/35/50/60/80/105/ 135, APO Rodagon 50/90 mm, SCHNEIDER Componon W/A 40/60/80 mm, Comparon 50/75/135 mm, EL NIKKOR 50/63/75/ 80/105/135 mm. Mounts on the negative stage in place of standard negative stage plate to provide masking with optional 4x5" glass (universal) carrier.